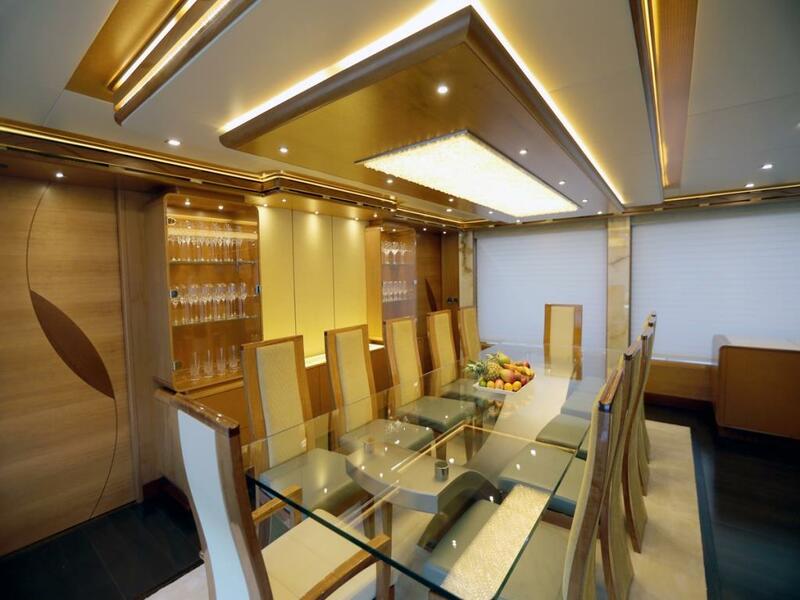 Her interior decor is elegant, spacious and contemporary. 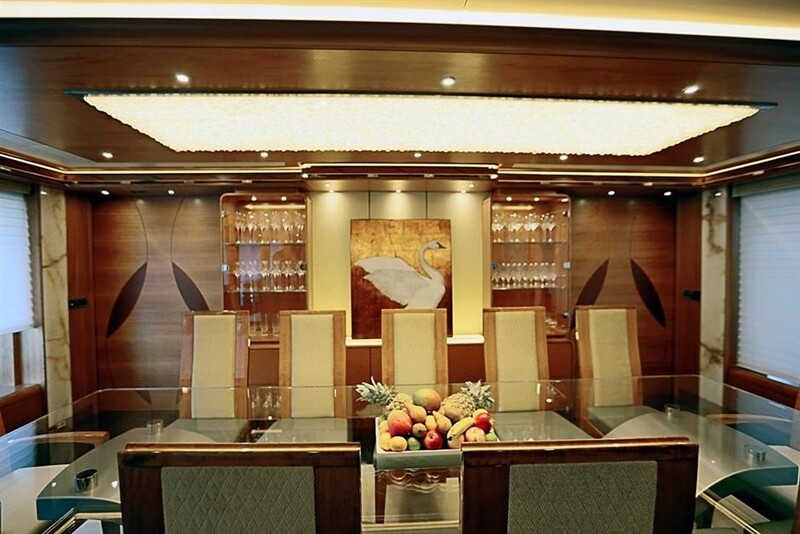 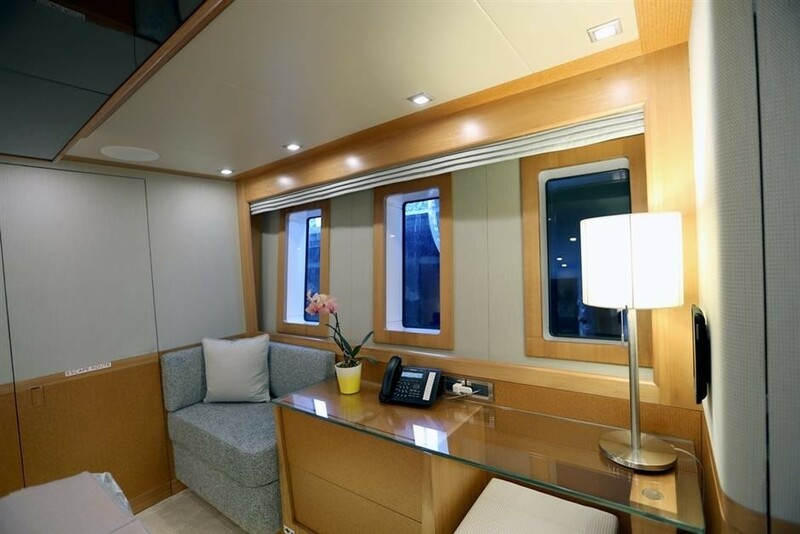 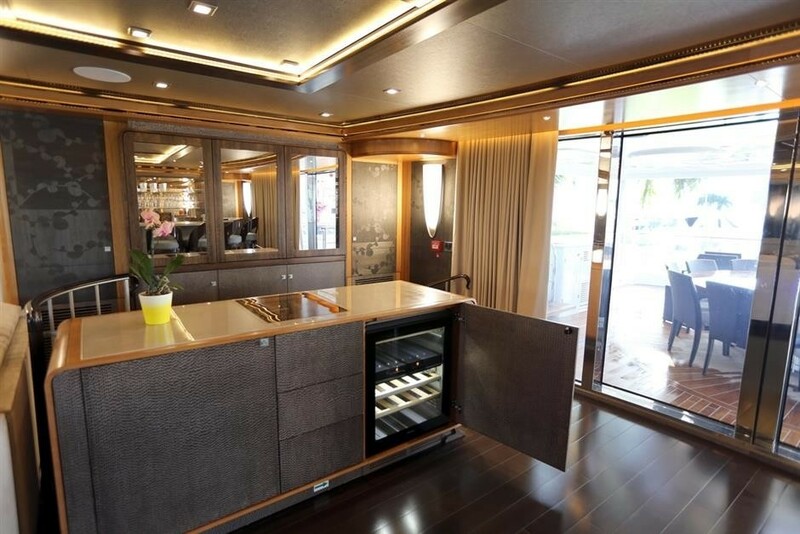 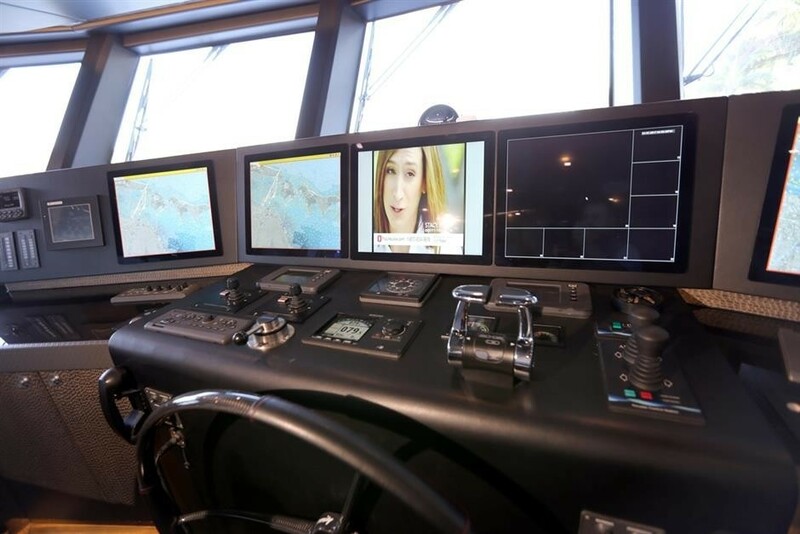 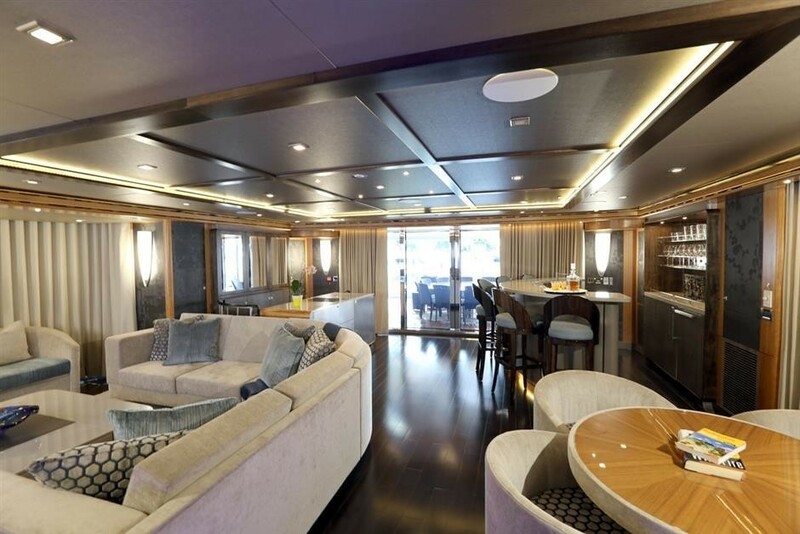 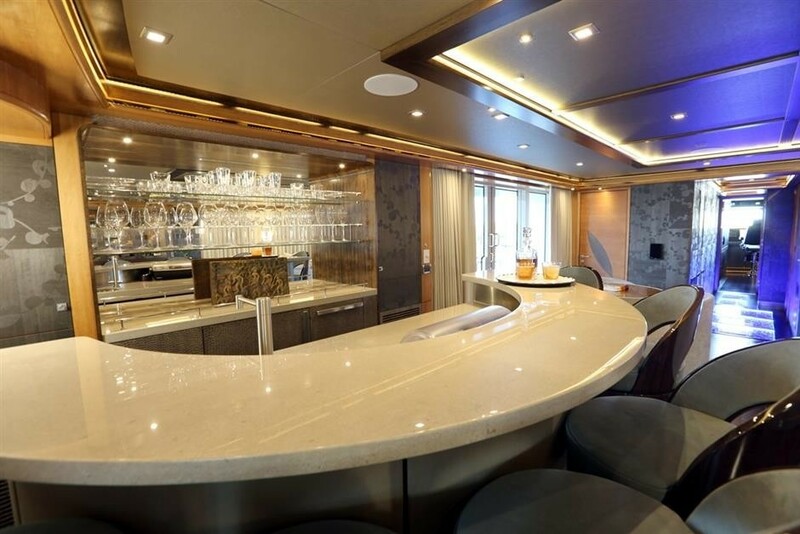 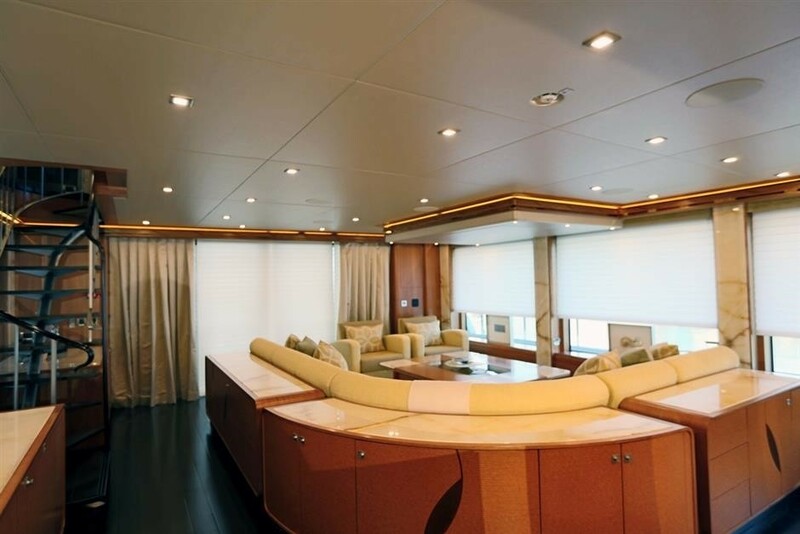 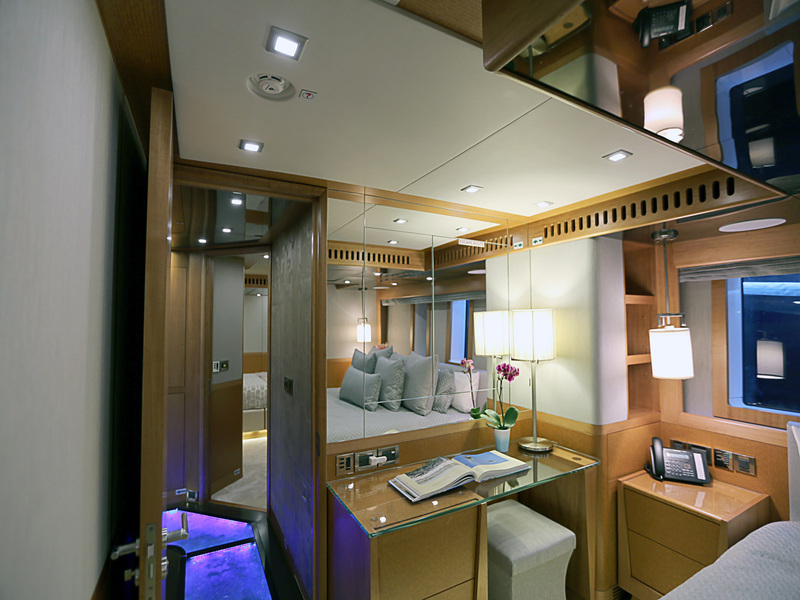 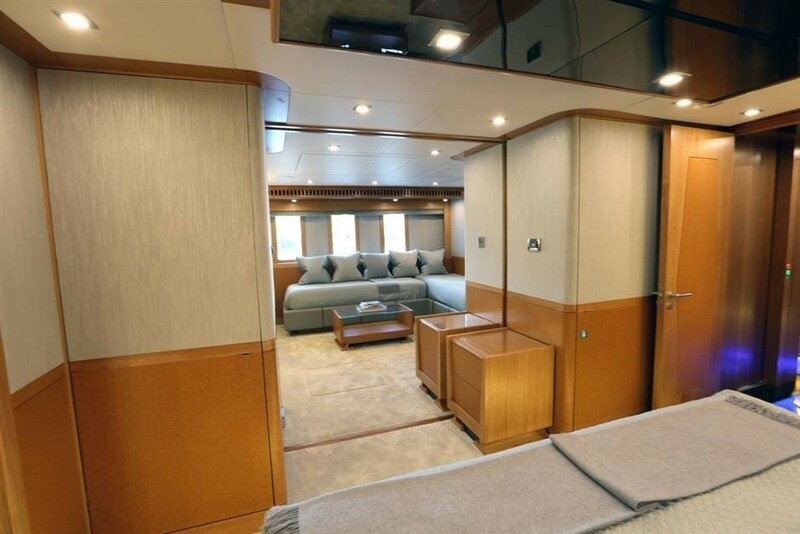 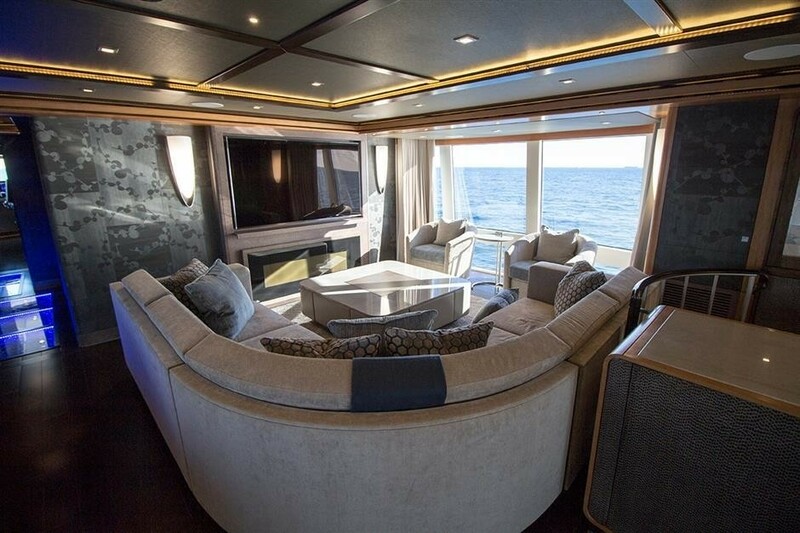 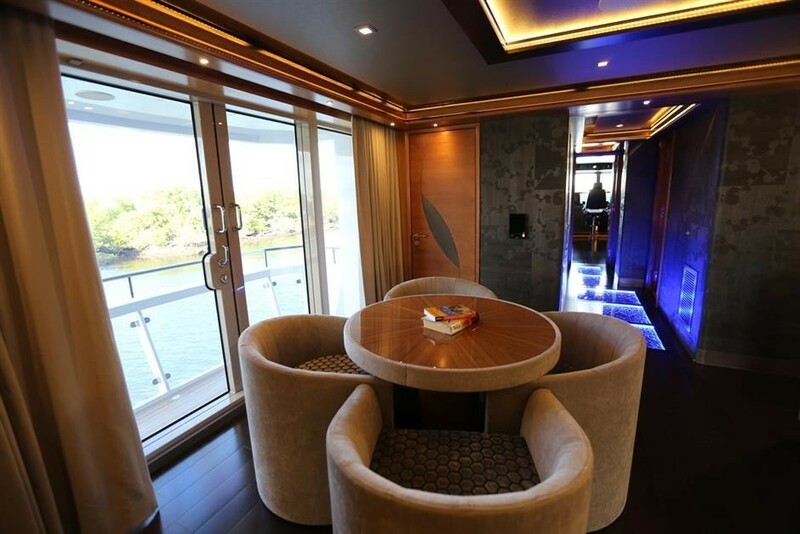 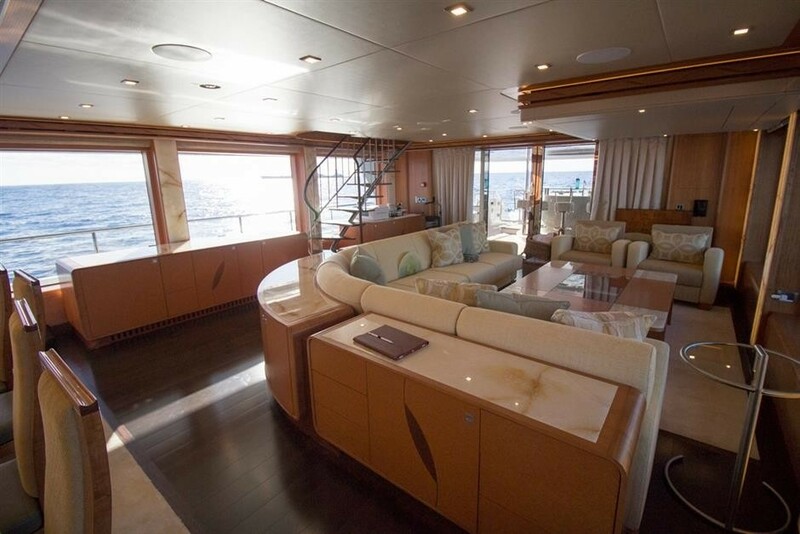 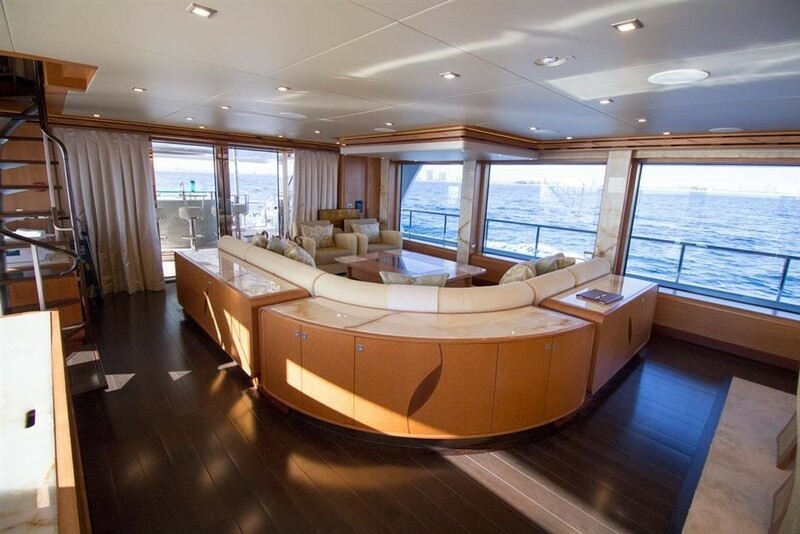 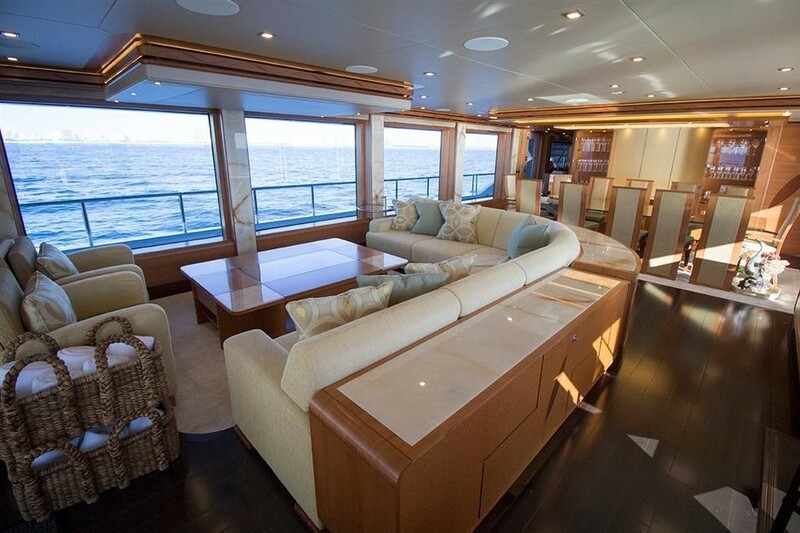 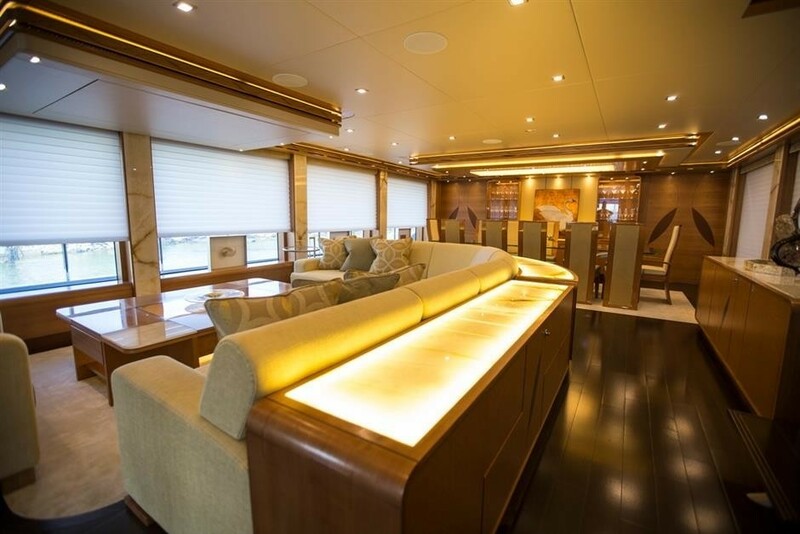 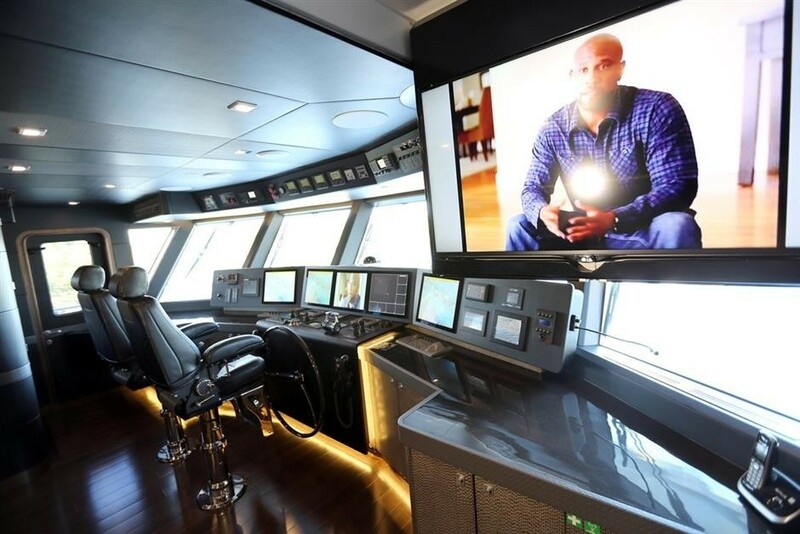 On the main deck is a generous salon with open plan dining forward. 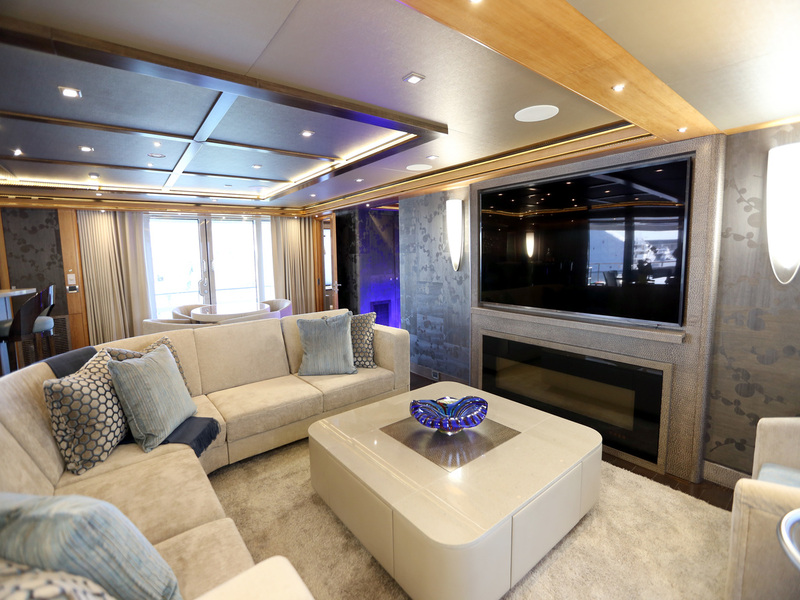 The lounge offers a plush sofa, occasional chairs, coffee table and entertainment. 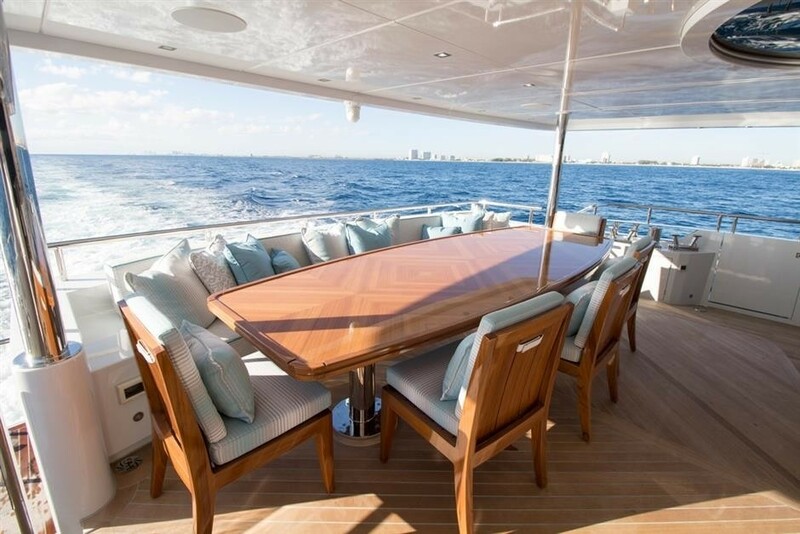 Forward is the formal dining table, easily seating 12 guests in style. 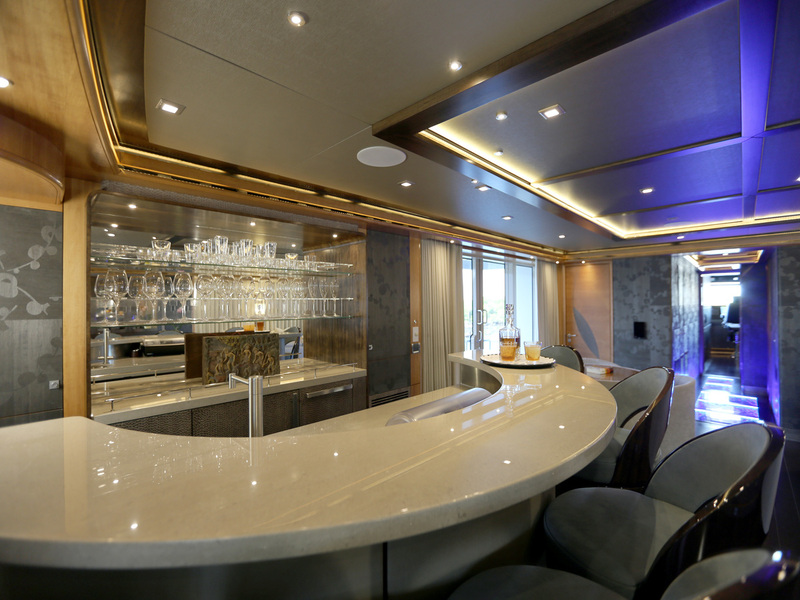 An upper deck skylounge features a further salon space, wet bar, games table, balcony and full entertainment. 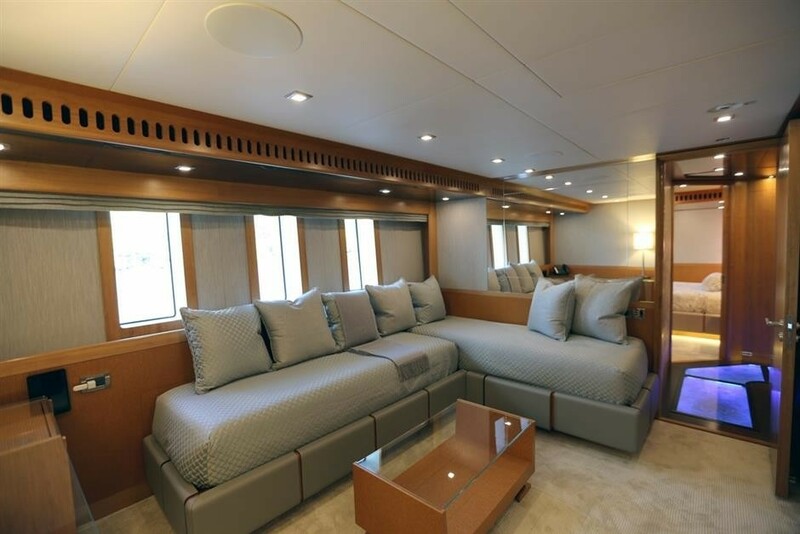 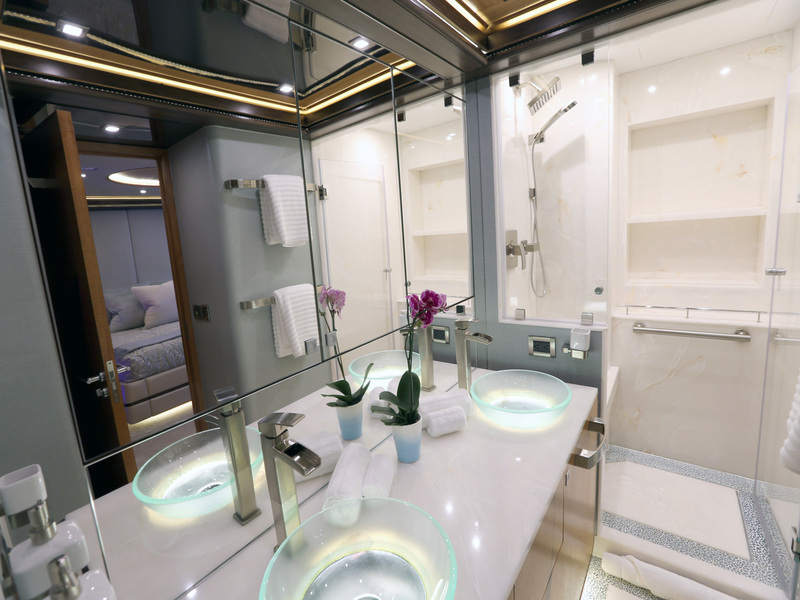 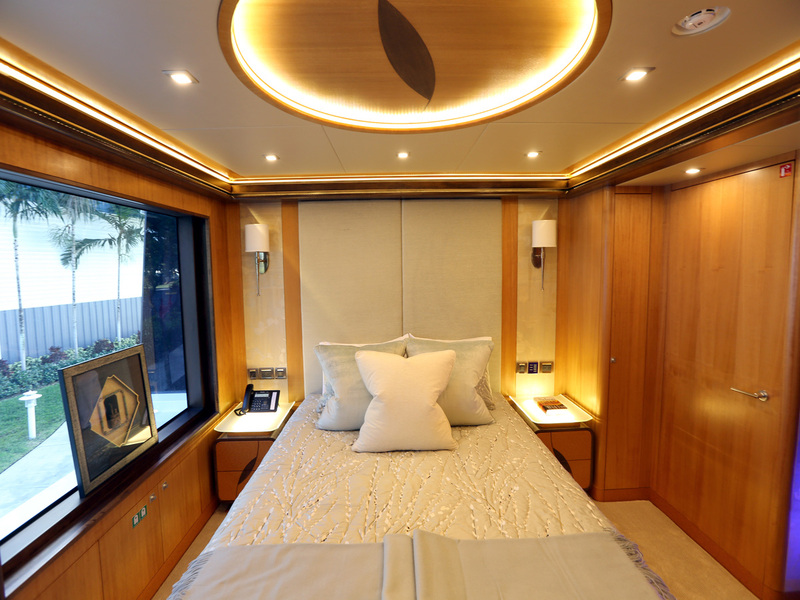 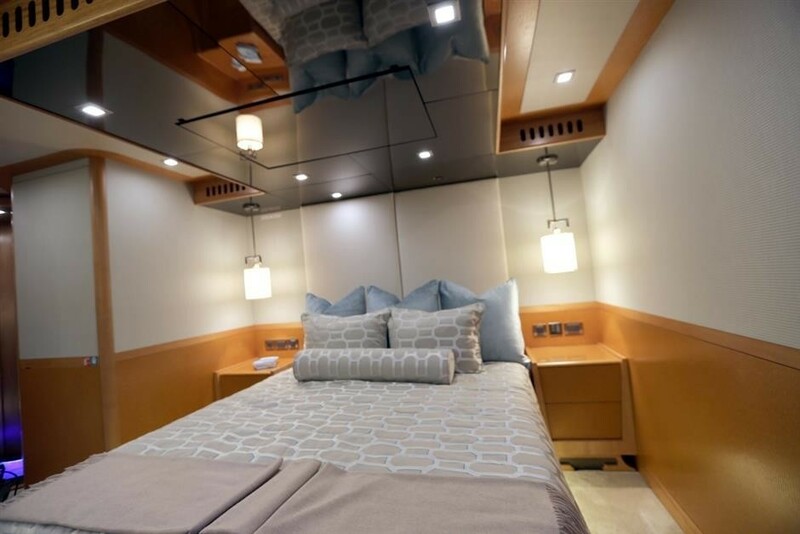 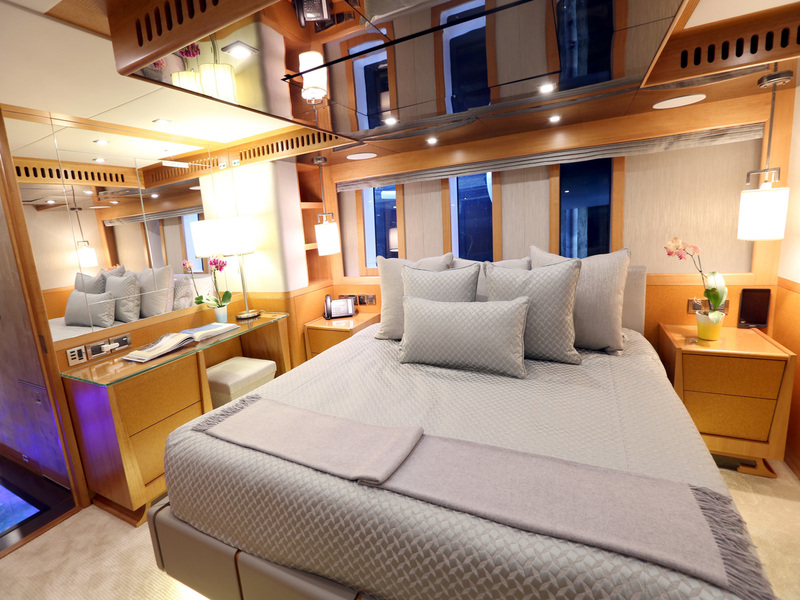 Luxury charter yacht Serenity can comfortably sleep her guests in 6 lovely staterooms, including the owner’s stateroom, which is located on the main deck, A VIP cabin on the upper deck and four guest cabins on the lower deck. 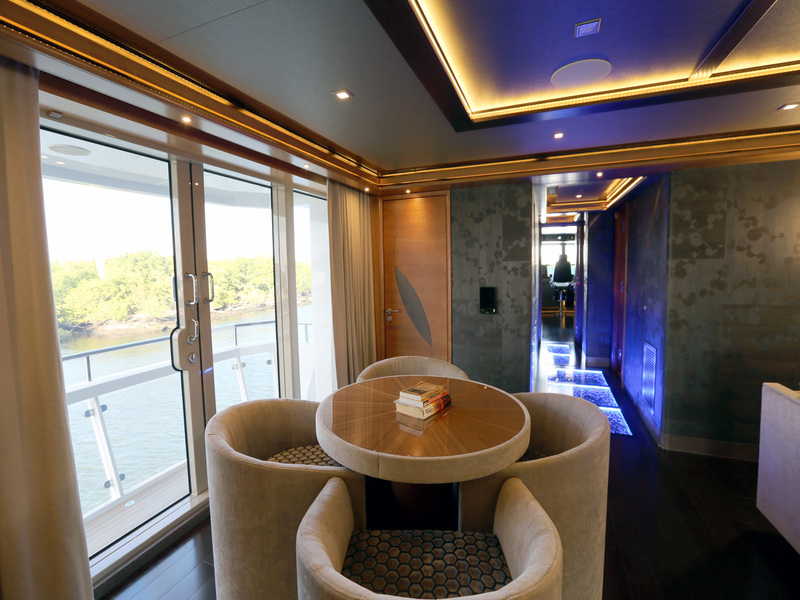 Exterior living is well-appointed. 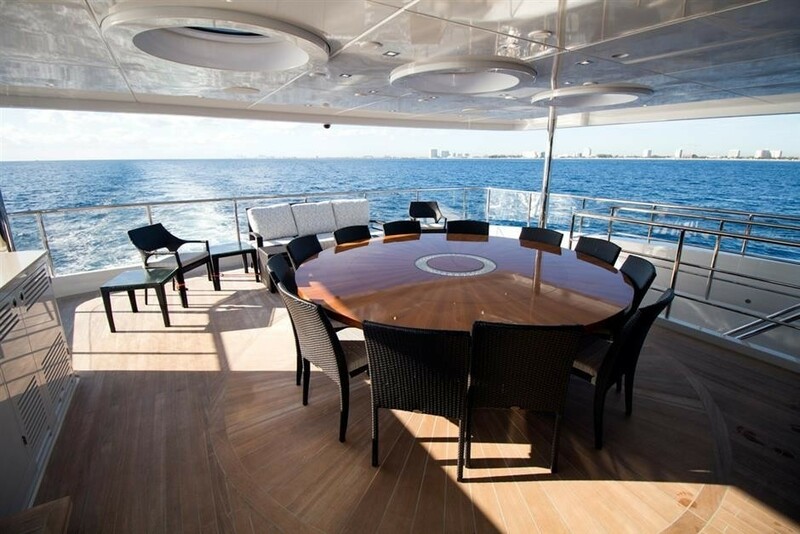 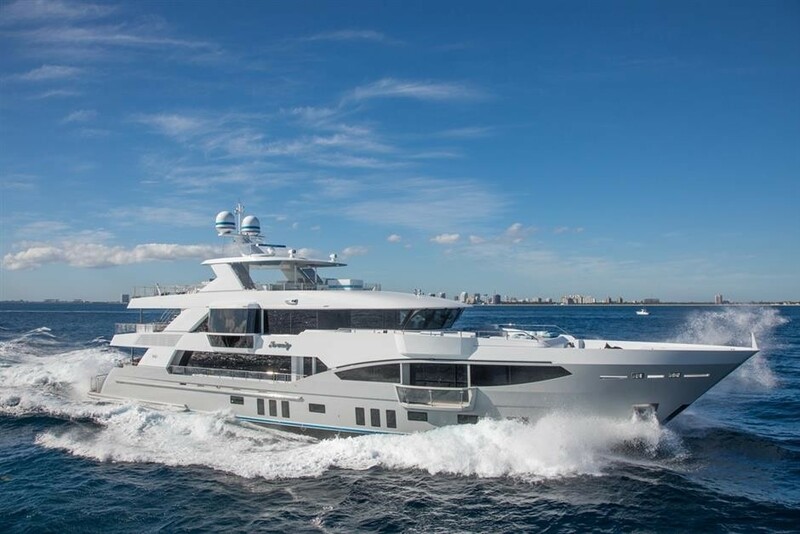 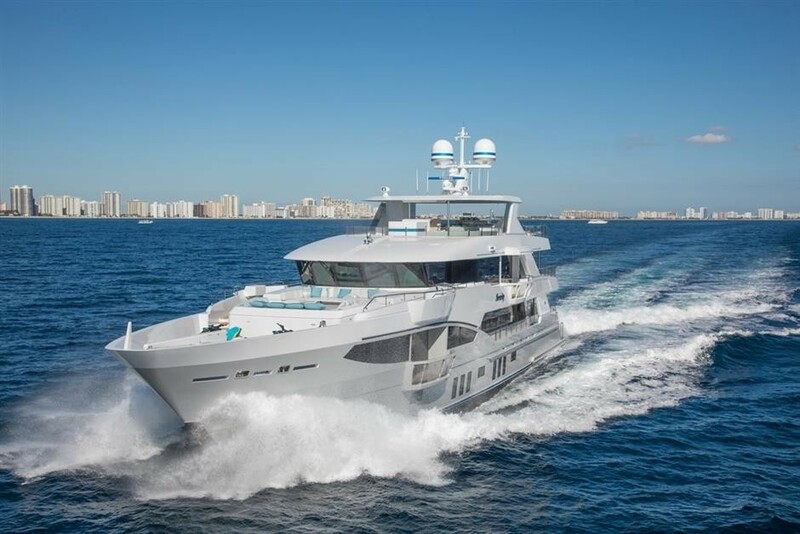 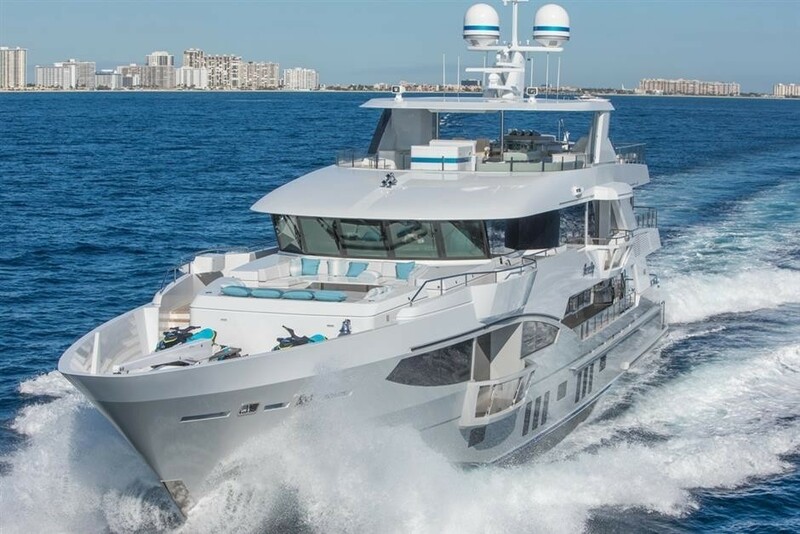 The main deck aft offers a shaded alfresco dining table and wet bar, followed by steps to the swim platform, where guests can enjoy the water toys, or simply lounge in the beach club. 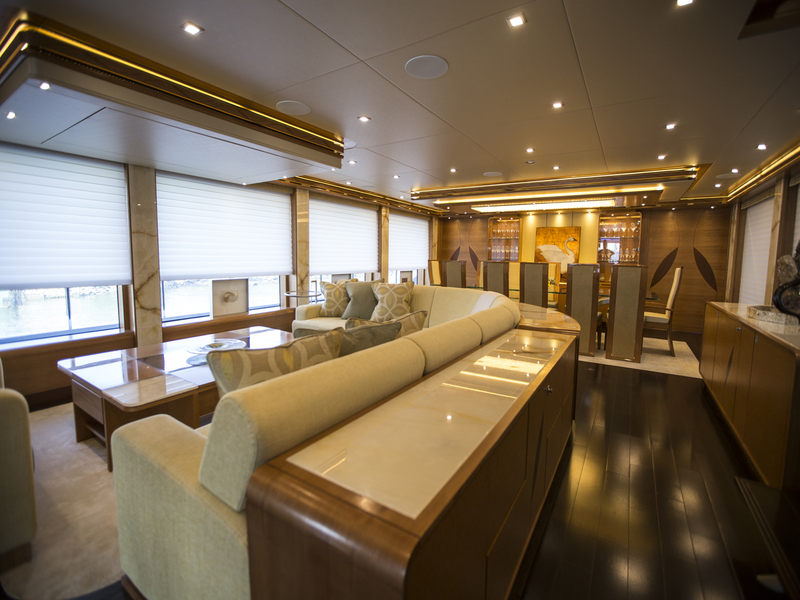 Adjacent to the skylounge is the upper aft deck, with additional alfresco dining, seating and service area. 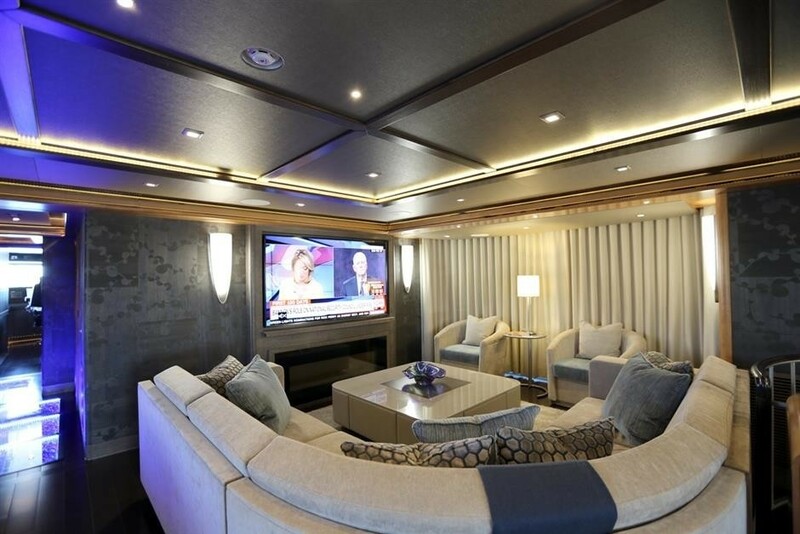 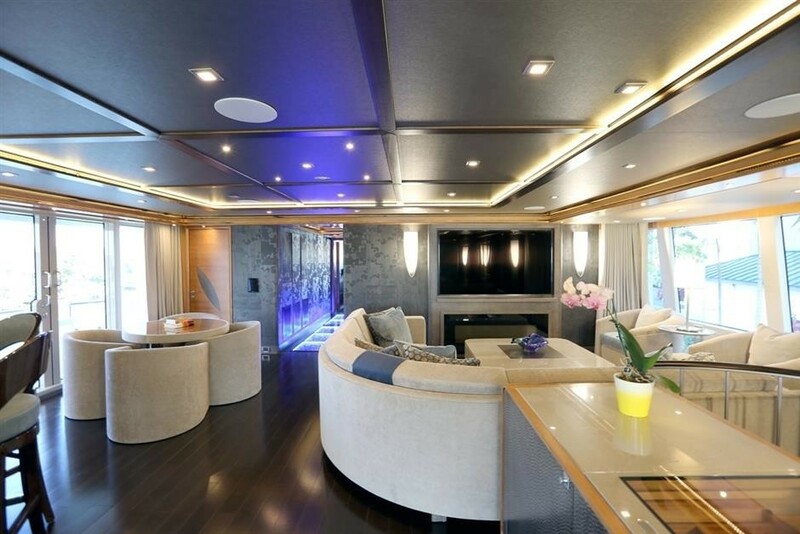 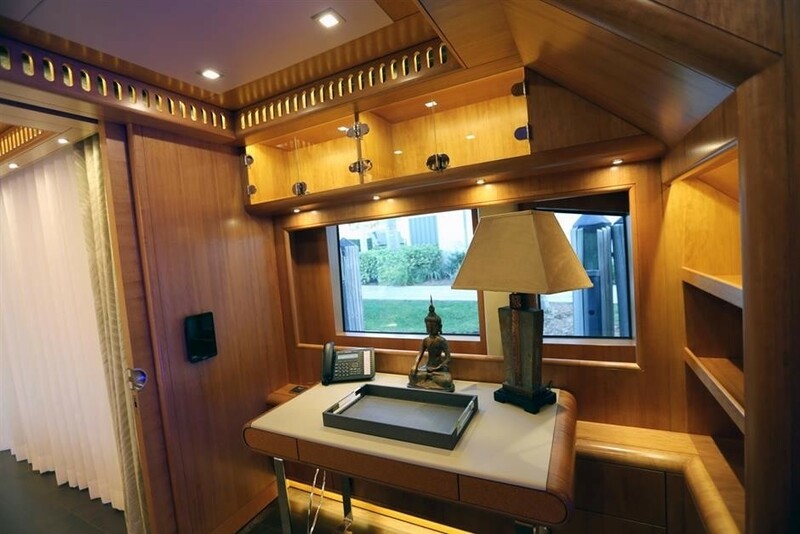 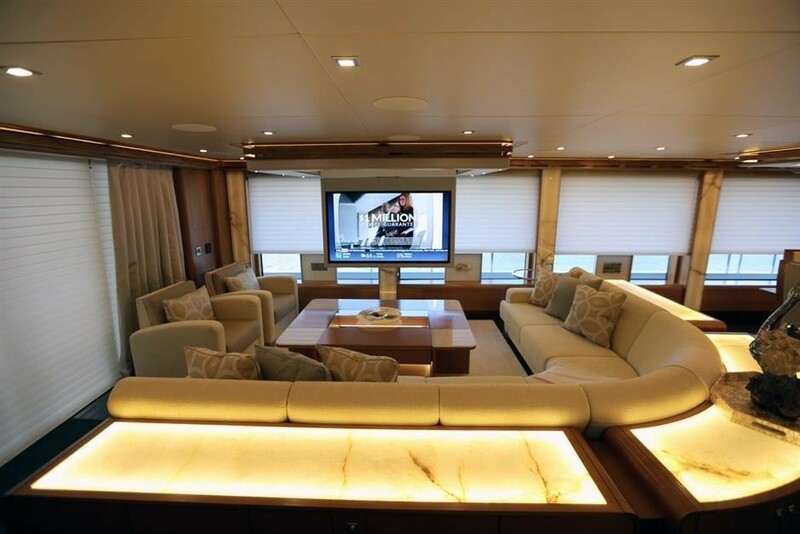 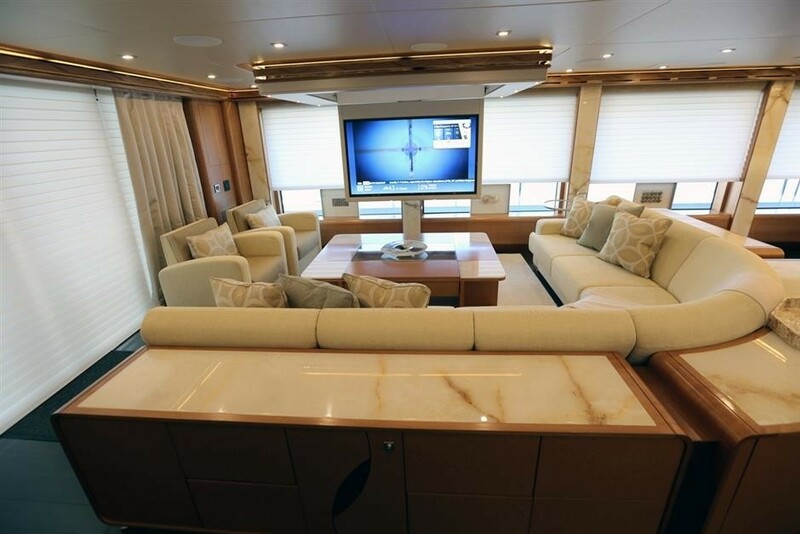 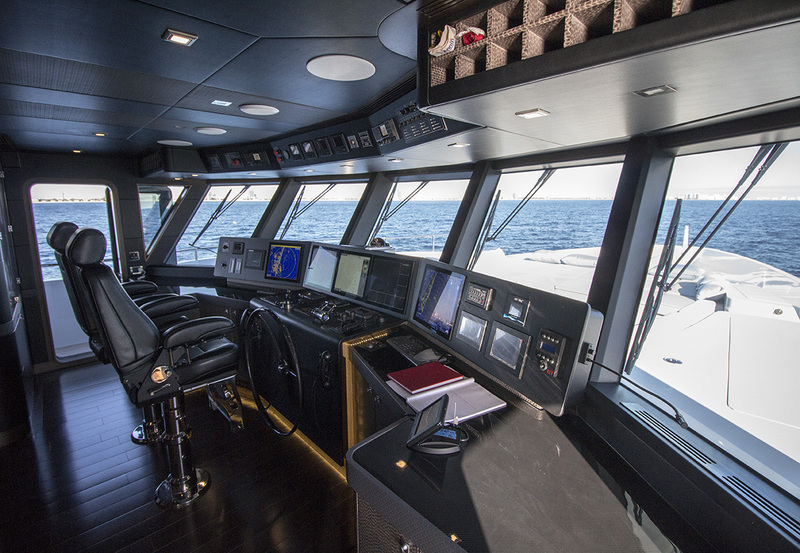 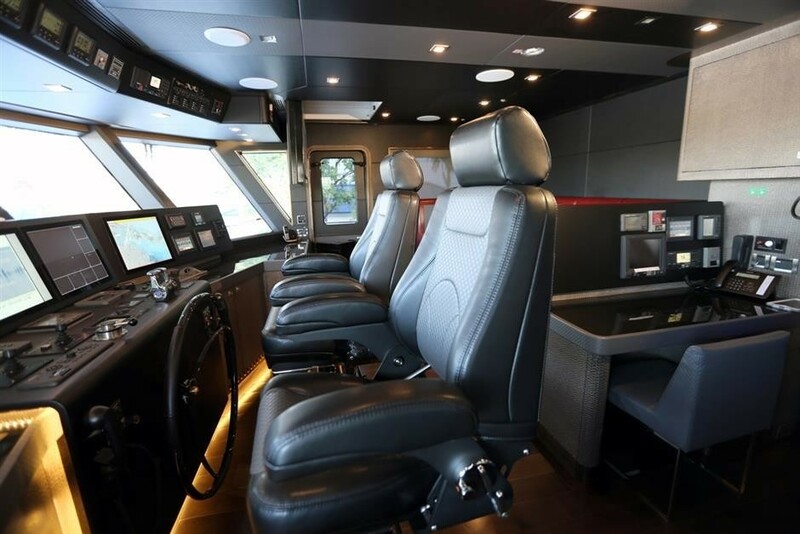 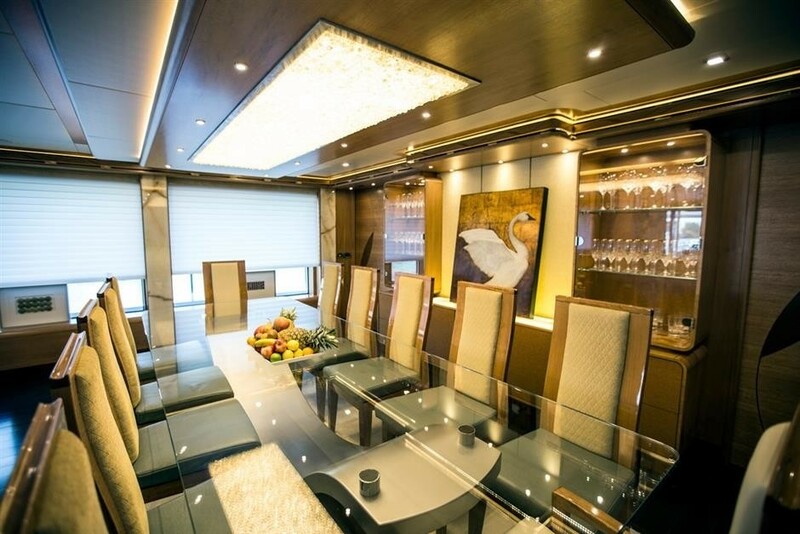 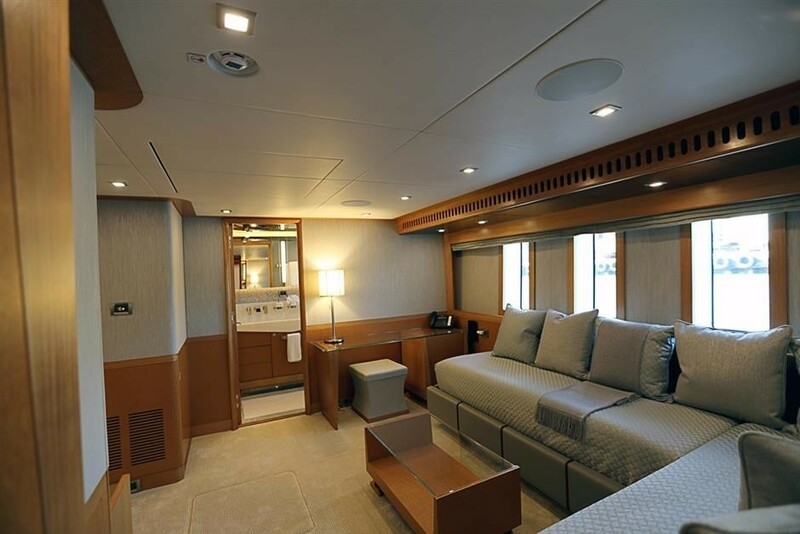 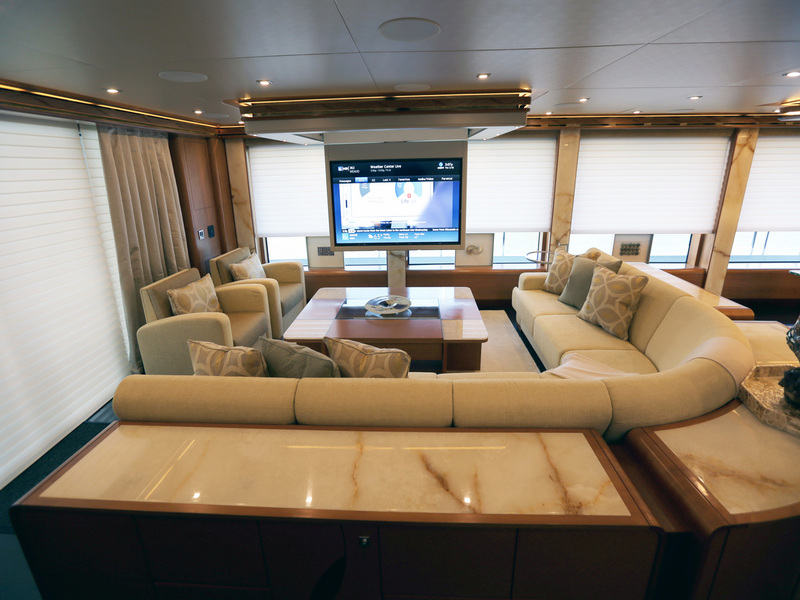 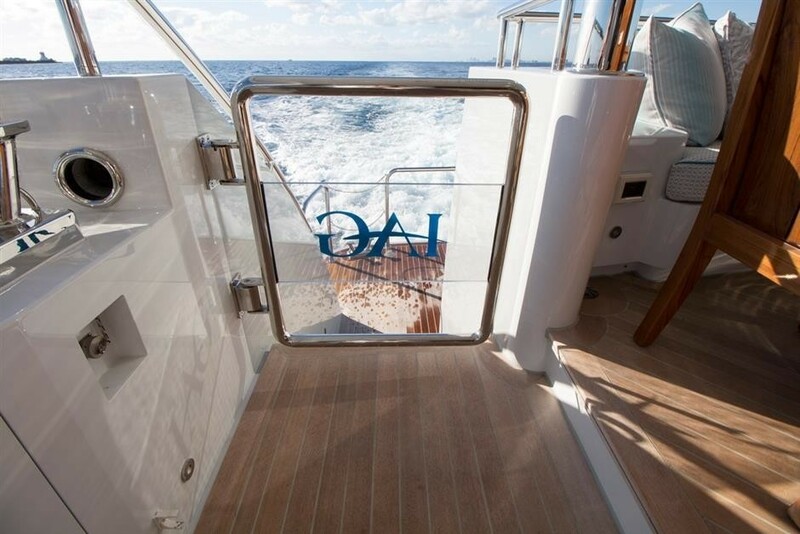 The yacht features a raised foredeck and seating, boasting fantastic views. 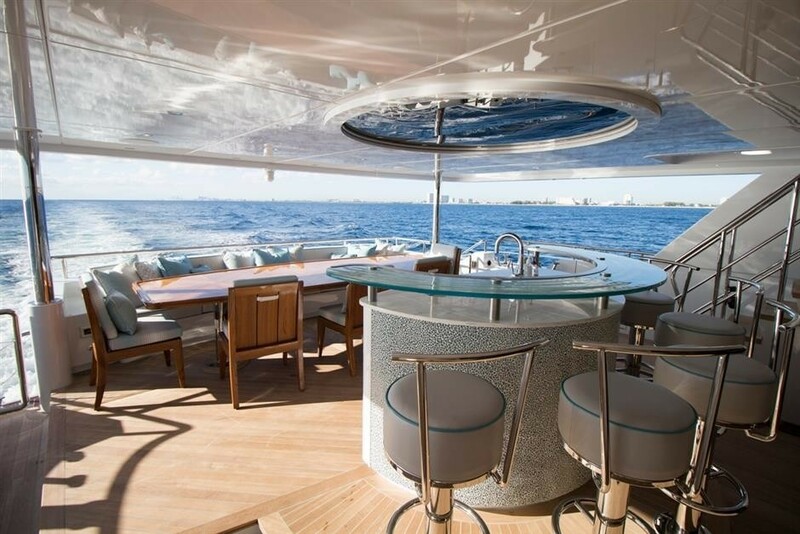 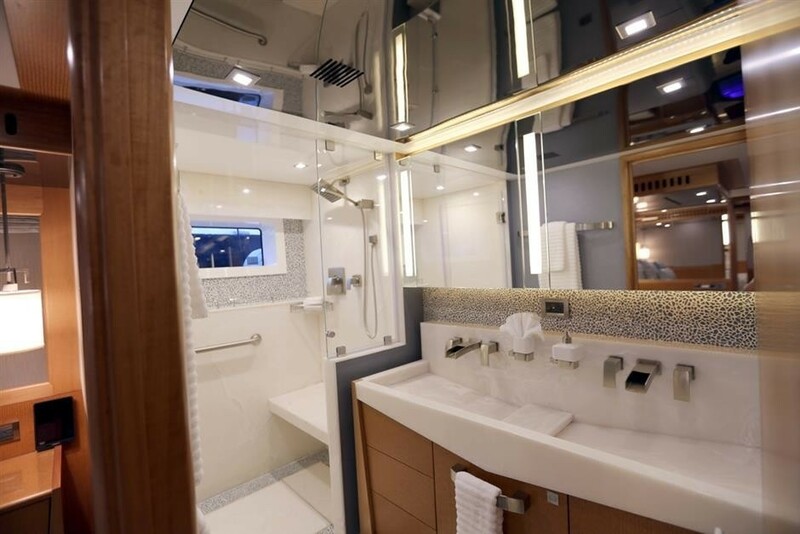 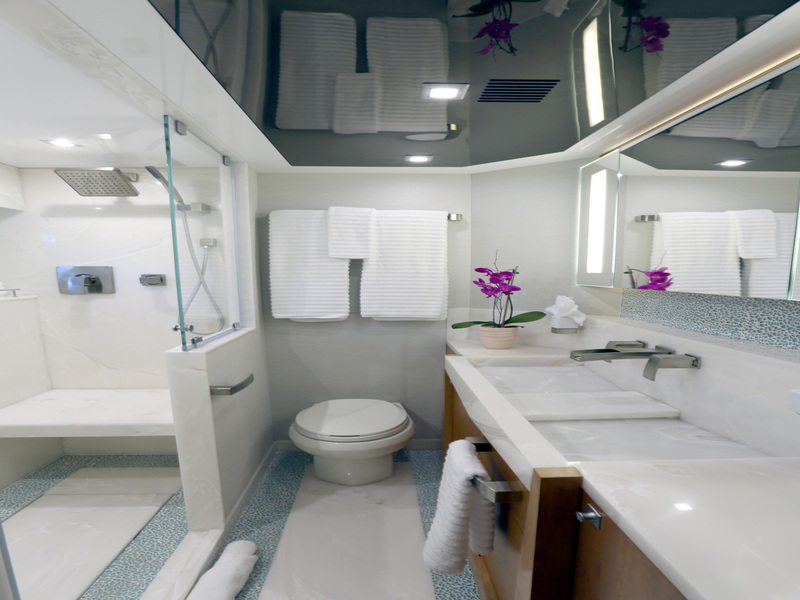 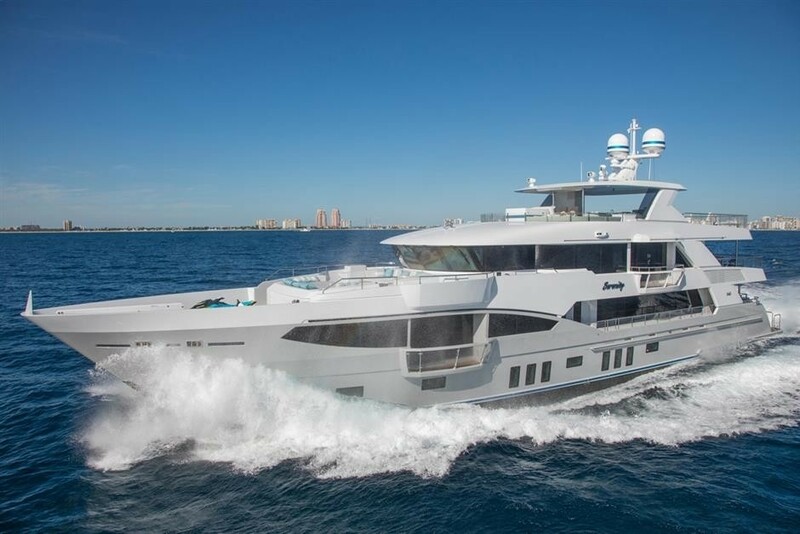 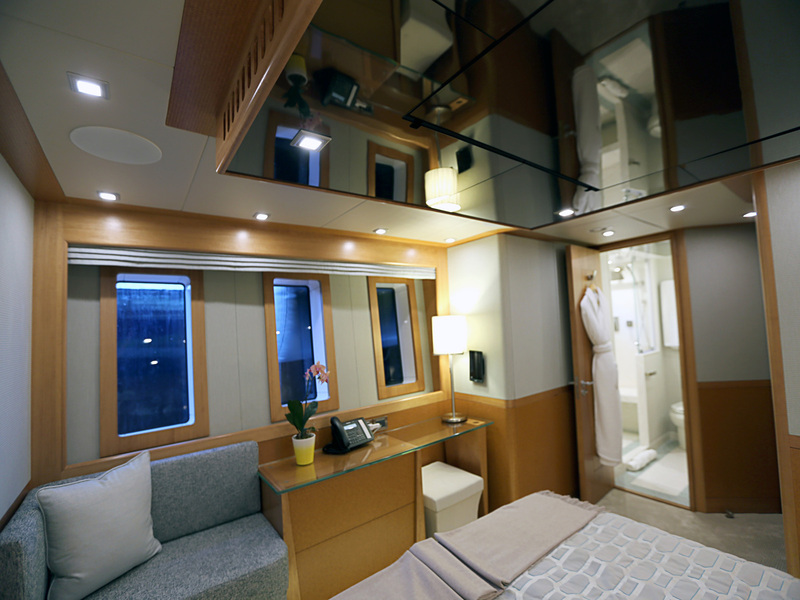 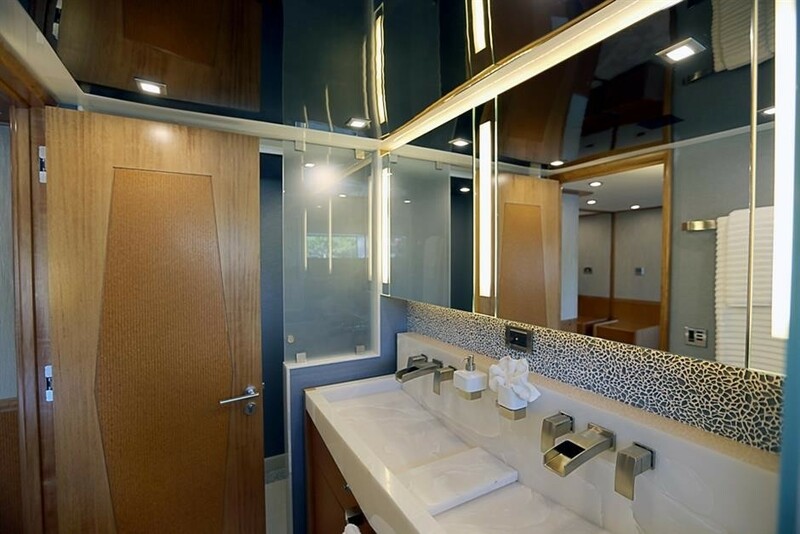 On the top deck is a spacious sundeck, complete with Jacuzzi tub with waterfall and wading area, wet bar, misting system, grill area and day head. 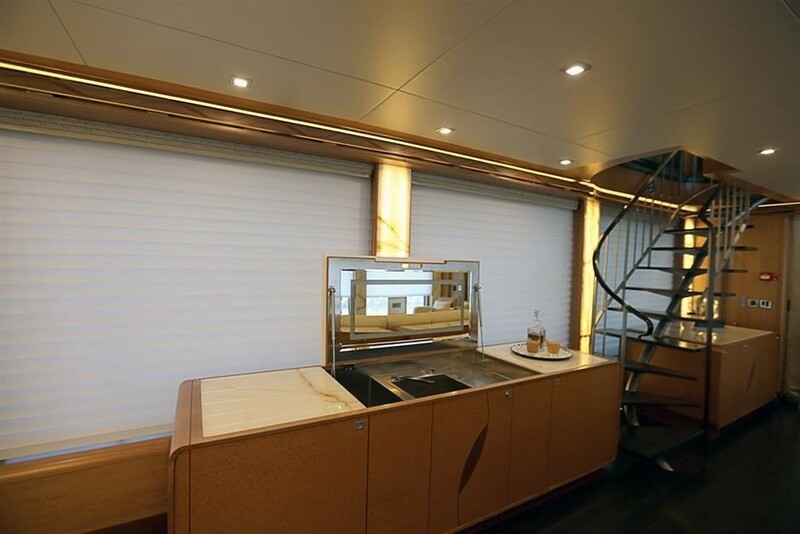 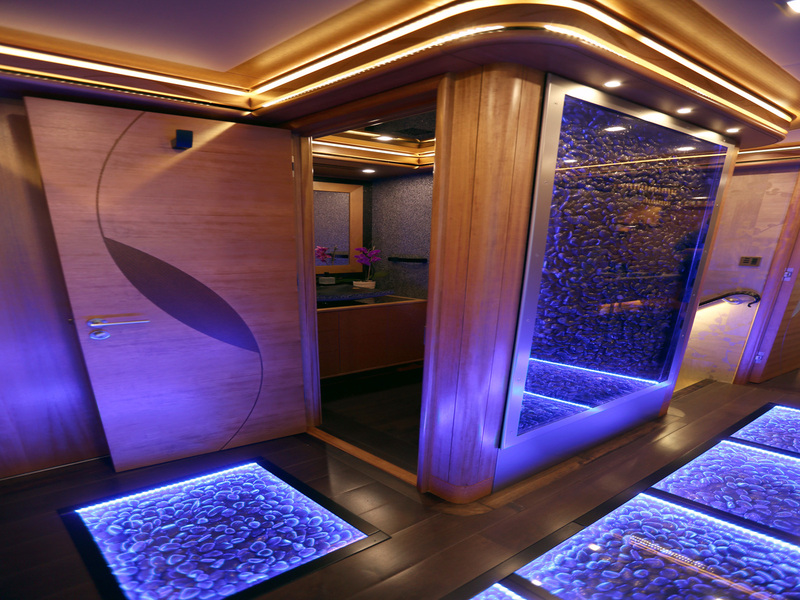 An elevator reaches all decks from guest accommodation on the lower deck, to the sundeck. 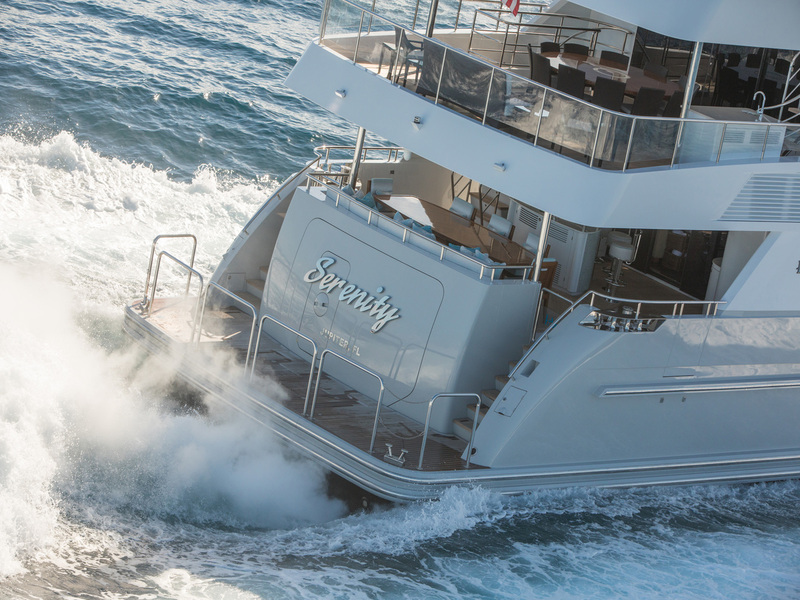 Superyacht Serenity is powered by twin Caterpillar C-32 diesels, delivering her a cruising speed of 15 knots. 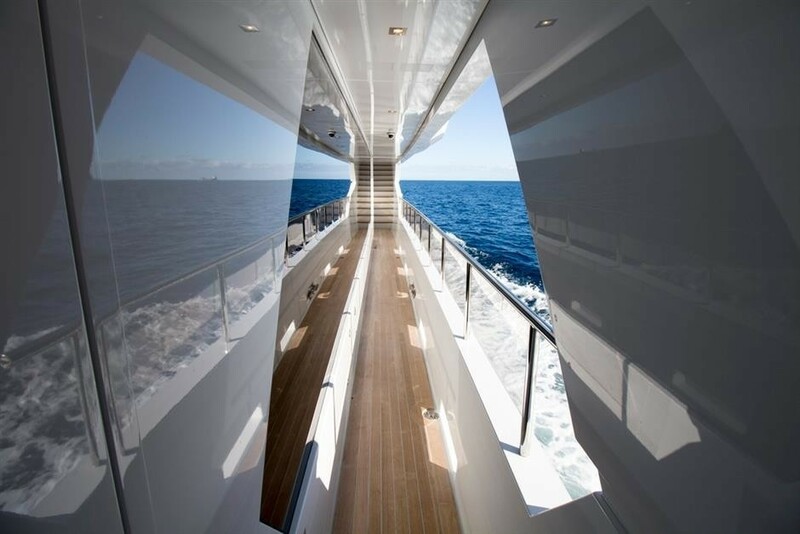 Her beam is of 7,92m (26'5''). 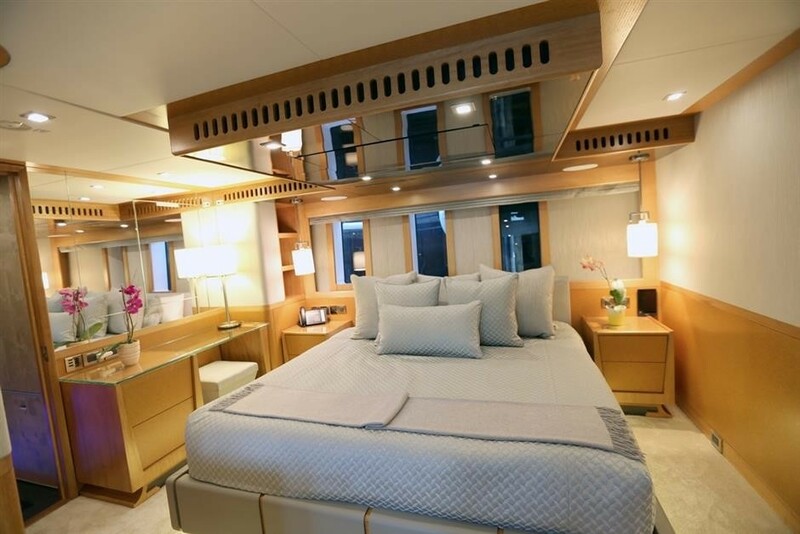 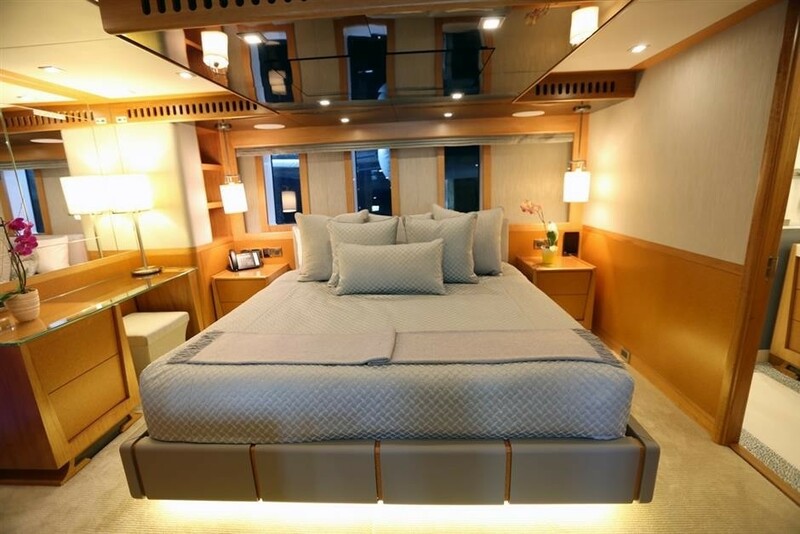 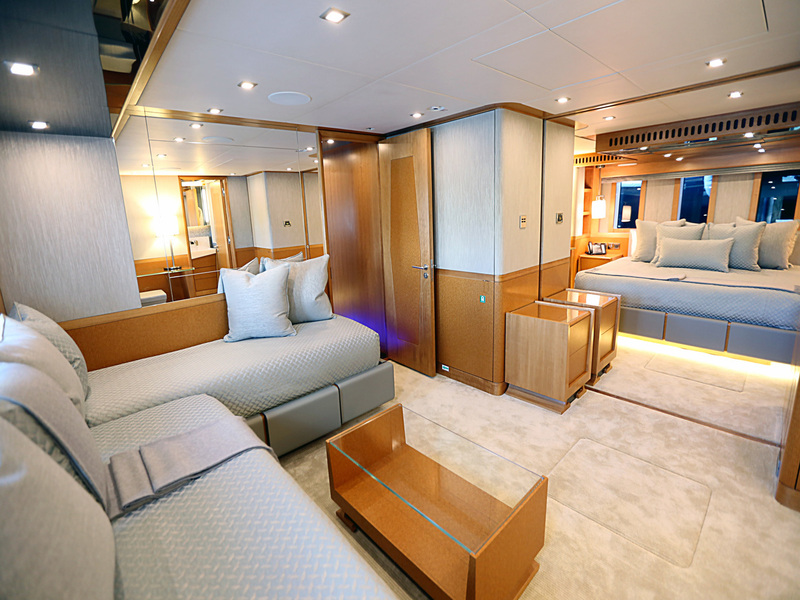 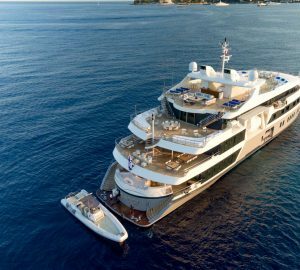 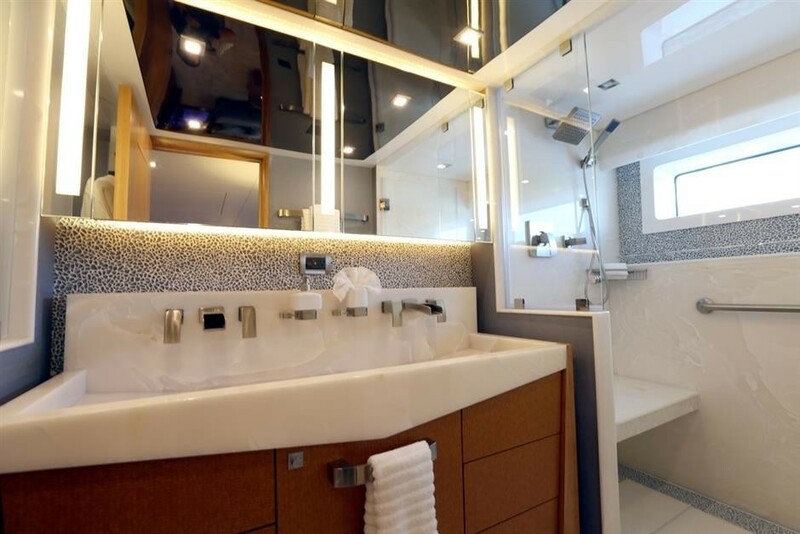 Accommodation aboard Noblestar Terrazza 133 yacht Serenity is divided into 6 magnificent staterooms, including the owner’s stateroom, which is located on the main deck, and four guest cabins on the lower deck.